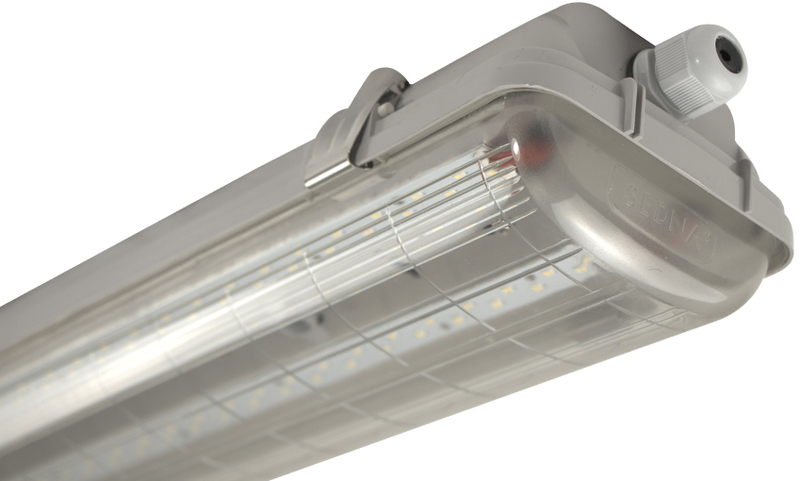 A revolutionary LED replacement to replace complete non-corrosive fluorescent tube fittings. A complete LED – capable of 100lm/w, with IK09 shatter-proof diffuser, stainless steel clips as standard, 40% more efficiency and a 40,000hr life. Popular commercial and industrial lighting solution. A revolutionary LED replacement to replace complete non-corrosive flourescent tube fittings. Utilising Epistar SMD2835 with direct illumination technology, proves advantageous over both conventional flourescents and LED tube counterparts in terms of industry leading efficacy: 100lm/W. 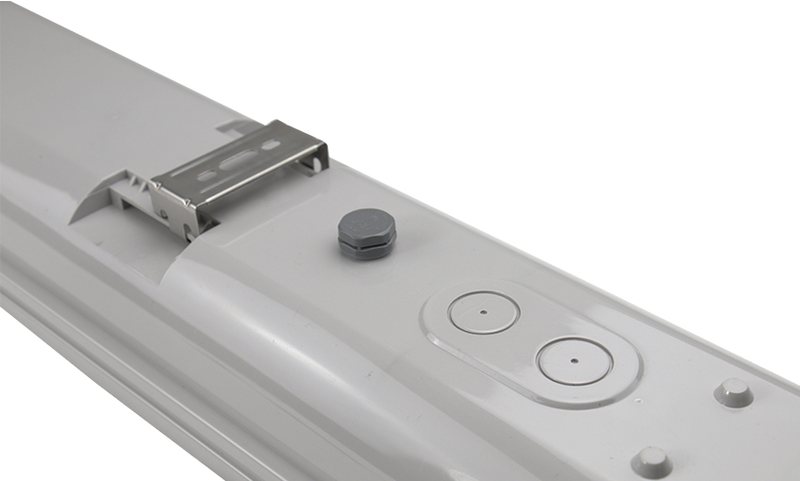 Hence an L70 rated lifetime of 40,000+ hours, IK09 rated shatter-proof optically enhanced diffuser and stainless-steel clips for simple installation, this unit has proved to be the specifiers number one choice being deemed truly ‘fit- and-forget’. Wide demand throughout commercial and industrial sectors, namely workshops, high-humidity areas and outbuildings, as well as suitable for site lighting being 110V multi-voltage. Options clear/frosted shatter-proof polycarbonate diffuser for uniform lumen output with robust PC base. Unit comes complete with stainless steel clips as standard, detachable hinged tray for ease of install, fixing brackets and M20 x 1.5 IP65 cable gland for side hole or rear knockout. 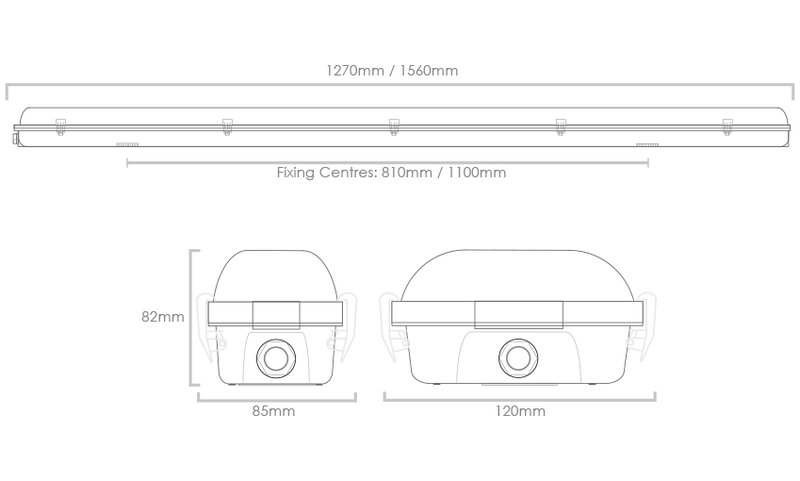 Options of 4ft/1200mm and 5ft/1500mm in single & twin variation. Further options include internal built in 3-hour maintained/ non-maintained (M3/NM3) emergency pack (SDIP65-XXXX-EM) & microwave intelligent control sensor (SDIP65-MI). Further options include dimmable options: 1-10V (-AD) & DALI (-DL) with advanced programmable occupancy controls from batten-mount PIR (-PIR) suitable for daylight & non-occupancy detection/dimming. Spares: S/S Clips x 10 (SDIP65-CLP), Clear Diffuser (SDIP65-XXXX-CLD), Frosted Diffuser (SDIP65-XXXX-FRD).